Announcing a New and Improved Risk Management Platform! The upgrade to your risk management platform is scheduled to go live Monday, November 16, 2015, at 7 am. The system will be undergoing this change the weekend prior and will be inaccessible from Friday the 13th at 7:00 PM to 7:00 AM on the 16th. We encourage you to attend an overview webinar to learn about the new features and functionality before the platform goes live. If you access the platform on an earlier version of Internet Explorer, you will need to upgrade to the latest version to maintain access. Elimination of Access Codes – When you login on Monday the 16th each user will be prompted to choose a unique Username and Password. Please review this short What’s New Video to see some highlights of the new platform. Trainings on all of the new platform applications begin the week of November 16. You can register for any of them by going to the Help & Training Center within the risk management platform. These training shorts can improve safe work habits, productivity, and morale. The shorts cover a wide variety of work-related subjects to assist your organization in preventing injuries. Lists common fall risks on construction sites. This webinar was developed by certified safety and health experts who will provide an overview of the Total Cost of Risk and its importance to risk management efforts. Join us for an educational overview webinar to learn more about the applications within your risk management platform. These webinars are designed to help you get more out of your platform and improve your productivity. 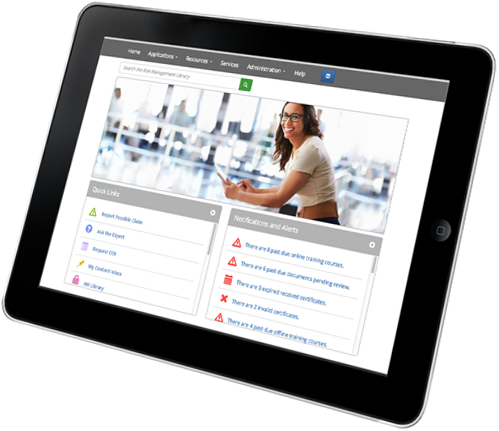 We can record all your training files, incident reports, import lists of employees, and more — all in one place and at very reasonable rates! OSHA has issued its new rule for confined spaces in construction, which will cover employers with employees working at construction sites with one or more confined spaces. The rule takes effect August 3, 2015. Newly regulated construction sites will include buildings, highways, bridges, tunnels, utility lines, and other types of projects. Potentially affected employers include general contractors, as well as specialty-trade construction contractors and employers engaged in some types of residential construction work. It includes requirements for training, identification and assessment of confined spaces, hazard analysis, entering, working, exiting, and rescue for confined spaces containing a variety of different hazards. The new rule, which provides construction workers safeguards similar to those in place for manufacturing and general industry, could protect 800 workers a year from serious injuries and reduce life-threatening hazards according to OSHA. Although construction workers must often enter confined spaces like manholes, crawl spaces, and tanks, these areas are not intended for continuous occupancy. They are also difficult to exit in an emergency. OSHA says these workers face life-threatening hazards including toxic substances, electrocutions, explosions, and asphyxiations. The new rule differs in several ways from current confined space regulations. For example, it includes a requirement that multiple employers share vital safety information and continuously monitor hazards. OSHA says these advancements are possible due to technological improvements that were not available when the manufacturing and general industry rules were created. Explained OSHA administrator Dr. David Michaels, “Unlike most general industry worksites, construction sites are continually evolving, with the number and characteristics of confined spaces changing as work progresses.” The standard emphasizes training, continuous worksite evaluation, and communication requirements. Employers should also note that under the new rule, crawl spaces and attics can be both confined spaces and permit-required confined spaces. For example, working in an attic and applying a large amount of spray foam in a short time can expose a worker to low oxygen levels or a hazardous atmosphere. As well, changes to the entry/exit, ease of exit, and airflow could create a confined space or cause the space to become permit-required. Are large enough for a worker to enter. Have limited means of entry or exit. A location may also be a permit-required confined space if it has a hazardous atmosphere, the potential for engulfment or suffocation, a layout that may trap a worker, or any other serious safety or health hazards. Have a competent person evaluate the site for the presence of confined spaces, including permit-required ones. Once the space is classified as a permit-required confined space, identify the means of entry and exit, proper ventilation methods, and elimination or control of all potential hazards in the space. Ensure before workers enter that the air in a confined space is tested for oxygen levels, flammable and toxic substances, and stratified atmospheres. If a permit is required for the space, remove or control hazards in the space and determine rescue procedures and necessary equipment. If the air in a space is not safe for workers, ventilate or use necessary controls or protections so that employees can work safely. The Tedrick Group is sharing with you an article posted on the IRS.gov website on the “Basics of Employer Reporting” and “who is Required to Report”. We hope you find this information helpful as we continue our efforts to keep you informed on changes that affect you with regard to the ACA. The following information is found on the IRS.gov website. Click http://www.irs.gov/Affordable-Care-Act/Employers/Questions-and-Answers-on-Reporting-of-Offers-of-Health-Insurance-Coverage-by-Employers-Section-6056 to see the article in it's original environment. Information reporting under section 6056 is first required in early 2016 with respect to calendar year 2015. For more information, see question 2. More information is available on the information reporting by applicable large employers page. For details about the section 6056 information reporting requirements and additional guidance on how to complete Form 1094-C, Transmittal of Employer-Provided Health Insurance Offer and Coverage Information Returns, and Form 1095-C, Employer-Provided Health Insurance Offer and Coverage, see the Employer Information Reporting FAQs for Forms 1094-C and 1095-C on IRS.gov. Yes. In implementing new information reporting requirements, short-term relief from reporting penalties frequently is provided. This relief generally allows additional time to develop appropriate procedures for collection of data and compliance with the new reporting requirements. Accordingly, the IRS will not impose penalties under sections 6721 and 6722 on ALE members that can show that they have made good faith efforts to comply with the information reporting requirements. Specifically, relief is provided from penalties under sections 6721 and 6722 for returns and statements filed and furnished in 2016 to report offers of coverage in 2015 for incorrect or incomplete information reported on the return or statement. No relief is provided in the case of ALE members that cannot show a good faith effort to comply with the information reporting requirements or that fail to timely file an information return or furnish a statement. However, consistent with existing information reporting rules, ALE members that fail to timely meet the requirements still may be eligible for penalty relief if the IRS determines that the standards for reasonable cause under section 6724 are satisfied. See question 31 for more information about penalties under sections 6721 and 6722. The regulations under section 6056 provide further guidance on the information reporting requirements for applicable large employers, and the regulations under section 6055 provide guidance on the information reporting requirements for insurers and other health coverage providers. Regulations on the employer shared responsibility provisions under section 4980H provide guidance on determining applicable large employer status and determining full-time employee status, including defining and providing rules for calculating hours of service. The 1094/1095-C Questions and Answers provide guidance on how to complete Form 1094-C and Form 1095-C.
For purposes of the information reporting requirements under section 6056, each ALE member must file Form 1094-C (or a substitute form) with the IRS and furnish Form 1095-C (or a substitute statement) to its full-time employees, using its own EIN. See question 14 for further details about substitute forms and statements. All persons treated as a single employer under section 414(b), (c), (m), or (o) are treated as one employer for purposes of determining applicable large employer status under section 4980H. Under those rules, companies will be combined and treated as a single employer for purposes of determining whether or not the employer has at least 50 full-time employees (including full-time equivalents) and together will be an applicable large employer. Each of the companies that is combined is referred to as an ALE member. When the combined total of full-time employees (including full-time equivalents) meets the threshold, each separate company or ALE member is subject to the employer shared responsibility provisions even if a particular company or companies individually do not employ enough employees to meet the 50-full-time-employee threshold. See questions 15 through 17 of the employer shared responsibility provision FAQs for more information about calculating the number of full time employees (including full time equivalents). 8. Is an ALE member required to report under section 6056 if the ALE member has no full-time employees? An ALE member that did not have an employee who was a full-time employee in any month of the year (that is, no employee averaged at least 30 hours of service per week in any month) is not required to report under section 6056. An ALE member is required to report if it has an employee who was a full-time employee for any month of the year. For example, if an ALE member did not have at least one full-time employee in any month in 2015, it is not required to report in 2016 for calendar year 2015. 9. Is an employer that is not subject to the employer shared responsibility provisions of section 4980H (that is, the employer is not an ALE member) required to file under section 6056? No. An employer that is not subject to the employer shared responsibility provisions of section 4980H is not required to report under section 6056. Thus, an employer that employed fewer than 50 full-time employees (including full-time equivalents) during the preceding calendar year is not subject to the reporting requirements of section 6056. 10. Is an ALE member that sponsors a self-insured health plan required to file Form 1094-C and Form 1095-C if the ALE member has no full-time employees? Generally, yes. An ALE member that sponsors a self-insured health plan in which any employee or employee’s spouse or dependent has enrolled is required to file Form 1094-C and Form 1095-C, whether or not that employer has any full-time employees and whether or not that individual is a current employee or a full-time employee. For an individual who enrolled in coverage who was not an employee in any month of the year (for example, an ex-spouse electing coverage in his or her individual capacity and not through the employee’s election of spousal coverage), the employer may file Forms 1094-B and 1095-B for that individual. 11. Is an employer that is not an ALE member required to file under section 6056 if the employer sponsors a self-insured health plan that provides minimum essential coverage? No; however, such an employer is subject to the reporting obligations under section 6055. An employer that is not an ALE member that sponsors a self-insured health plan in which any individual has enrolled is not subject to the reporting requirements of section 6056. Such an employer will generally satisfy its reporting obligations under section 6055 by filing Form 1094-B and Form 1095-B. See section 6055 Questions and Answers. 12. Is an ALE member required to report under section 6056 with respect to a full-time employee who is not offered coverage during the year? Yes. An ALE member is required to report information about the health coverage, if any, offered to each of its full-time employees, including whether an offer of health coverage was (or was not) made. This requirement applies to all ALE members, regardless of whether they offered health coverage to all, none, or some of their full-time employees. For each of its full-time employees, the ALE member is required to file Form 1095-C with the IRS and furnish a copy of Form 1095-C to the employee, regardless of whether or not health coverage was or was not offered to the employee. Therefore, even if an ALE member does not offer coverage to any of its full-time employees, it must file returns with the IRS and furnish statements to each of its full-time employees to report information specifying that coverage was not offered. 13. Are different methods available to ALE members for reporting required information to the IRS and furnishing statements to employees? Yes. The regulations provide a general method (see question 14, below) that all ALE members may use for reporting to the IRS and for furnishing statements to full-time employees, and also provide alternative reporting methods (see questions 15-17, below) for eligible ALE members. If an ALE member cannot use the alternative reporting methods for certain employees, the ALE member must use the general method for those employees. In any case, the alternative reporting methods are optional so that an ALE member may choose to report for all of its full-time employees using the general method even if an alternative reporting method is available. In an effort to simplify the section 6056 reporting process, certain information required to be reported to the IRS and furnished to full-time employees may be reported through the use of indicator codes rather than by providing more detailed information. For further details about the section 6056 reporting process, see the instructions for Forms 1094-C and 1095-C.
14. What is the general method of reporting? As a general method, each ALE member may satisfy the requirement to file a section 6056 return by filing a Form 1094-C (transmittal) and, for each full-time employee, a Form 1095-C (employee statement). An ALE member that maintains a self-insured plan also uses a Form 1095-C to satisfy the reporting requirements under section 6055. The Form 1095-C has separate sections to allow ALE members that sponsor self-insured group health plans to combine reporting to satisfy both the section 6055 reporting requirements and the section 6056 reporting requirements, as applicable, on a single return. Under the general method, the section 6056 return (and, if the employer maintains a self-insured plan, the section 6055 return) also may be made by filing a substitute form but the substitute form must include all of the information required on Form 1094-C and Form 1095-C and satisfy all form and content requirements as specified by the IRS. 15. What are the alternative methods of reporting? 16. How does an ALE member report under the certification of Qualifying Offers method? An ALE member reporting under the certification of Qualifying Offers method may furnish a simplified statement to the employee rather than furnishing a copy of Form 1095-C as filed with the IRS. In general, however, the alternative statement is not available for an employer that sponsors a self-insured plan with respect to any employee who has enrolled in self-insured coverage under the plan because the employer is required to report that coverage on Form 1095-C.
For additional details on the reporting rules for Qualifying Offers, including the contents of the alternative statement, see the instructions for Forms 1094-C and 1095-C and the 1094-C and 1095-C Questions and Answers. 17. How does an ALE member report under the 98 percent offer method? An ALE member that certifies that it has offered, for all months of the calendar year, affordable health coverage providing minimum value to at least 98% of its employees for whom it is filing a Form 1095-C, and offered minimum essential coverage to those employees’ dependents, may qualify for simplified reporting procedures. For further details on the 98 percent offer method, see the instructions for Forms 1094-C and 1095-C and the 1094-C and 1095-C Questions and Answers. 18. When must an ALE member file the required information return with the IRS? An ALE member must file Form 1094-C and Form 1095-C for each employee with the IRS on or before February 28 (March 31 if filed electronically) of the year immediately following the calendar year for which the offer of coverage information is reported. Because transition relief applies for section 6056 reporting for 2014 (see Notice 2013-45), the first section 6056 returns required to be filed are for the 2015 calendar year and must be filed no later than February 29, 2016, or March 31, 2016, if filed electronically. Regulations under section 6081 address extensions of time to file information returns. 19. When must an ALE member furnish the statements to full-time employees? An ALE member must furnish the statement to each full-time employee on or before January 31 of the year immediately following the calendar year to which the information relates. This means that the first Forms 1095-C (the statements for 2015) must be furnished to employees no later than February 1, 2016 (January 31, 2016, being a Sunday). 20. Must an ALE member file the return with the IRS electronically? The regulations require electronic filing with the IRS of Form 1094-C and Form 1095-C except for an ALE member filing fewer than 250 Forms 1095-C during the calendar year. Each Form 1095-C for each full-time employee is counted as a separate return, and only Forms 1095-C are counted in applying the 250-return threshold for section 6056 reporting. For further details, see Affordable Care Act Information Returns (AIR) Program. 21. Must an ALE member furnish the employee statements to full-time employees electronically? The regulations permit, but do not require, employers to furnish Form 1095-C electronically to full-time employees if notice, consent, and hardware and software requirements modeled after existing rules are met. The regulations require that with respect to each full-time employee to whom the information is furnished, the ALE member must obtain consent from the employee before Form 1095-C may be furnished electronically. See the instructions for Forms 1094-C and 1095-C for additional information about obtaining consent for electronic furnishing. 22. May an ALE member furnish a Form 1095-C to an employee by hand delivery? Yes. Form 1095-C may be delivered to employees in any manner permitted for delivery of Form W-2 (Wage and Tax Statement). But see question 21 above for the requirements that must be met to furnish employee statements electronically. 23. Must an ALE member furnish a Form 1095-C within 30 days of the employee's written request if the employee terminates employment and requests the statement? No. This requirement is applicable to the furnishing of Forms W-2 (Wage and Tax Statement) under the provisions of section 6051 of the Internal Revenue Code, but is not applicable to the furnishing of a Form 1095-C. Accordingly, an employer may, but is not required to furnish a Form 1095-C upon an employee’s request following a termination of employment. In addition, if the employer furnishes a Form 1095-C to the employee under such circumstances and the relevant information changes (for example, the employee is rehired before the end of the year), the employer will need to furnish an updated Form 1095-C to the employee reflecting the updated information as filed with the IRS. 24. May an employer that is a governmental unit designate a third party to file the return and furnish the statements under section 6056 on its behalf? Yes. The regulations provide that an ALE member that is a governmental unit (defined as the government of the United States, any State or political subdivision thereof, or any Indian tribal government (as defined in section 7701(a)(40)) or subdivision of an Indian tribal government (as defined in section 7871(d)), may report under section 6056 on its own behalf or may appropriately designate another person or persons to report on its behalf. A person may be appropriately designated to file the return and furnish the statements under section 6056 on behalf of the ALE member if the person is part of or related to the same governmental unit as the ALE member. A government entity that is designated to file for another governmental unit is referred to as a Designated Government Entity (DGE). A separate Form 1094-C must be filed for each ALE member for which the appropriately designated person is reporting. The designated entity would provide the name, address and EIN of both the designated entity and the ALE member for which it is reporting. Additionally, the regulations require that there be a single identified Form 1094-C reporting aggregate employer-level data for the ALE member (including full-time employees of the ALE member the reporting for which has been transferred to a designated person), and that there be only one Form 1095-C for each full-time employee of the ALE member with respect to employment with that ALE member. For additional details, see the instructions for Forms 1094-C and 1095-C and the 1094-C and 1095-C Questions and Answers. 25. May an employer that is a governmental unit that sponsors a self-insured employer-sponsored health plan designate a third party to file the return and furnish the statements under section 6055 on its behalf? Yes. A governmental unit that sponsors a self-insured employer-sponsored health plan may designate its reporting obligations under section 6055 to a DGE. The procedures for a governmental unit to designate a DGE for reporting under section 6055 are the same as those for designating a DGE for reporting under section 6056 as described in question 24 above, and the regulations under section 6055. As with the designation under section 6056, a governmental unit that designates reporting under section 6055 will remain subject to section 4980H. 26. May an employer that is a governmental unit that sponsors a self-insured health plan designate its reporting obligations under section 6055 to a DGE but not designate its reporting obligations under section 6056? Yes. A governmental unit that sponsors a self-insured employer-sponsored health plan may designate its reporting obligations under section 6055 to a DGE, as discussed in question 24 above, but not designate its reporting obligations under section 6056. 27. How does a governmental unit delegating reporting responsibility to a DGE affect the requirement that one Form 1094-C be designated as the Authoritative Transmittal containing aggregate employer-level data? Each governmental unit that is an ALE member must file a single authoritative transmittal Form 1094-C containing the aggregate employer-level data for the governmental unit (meaning the total number of full-time employees and the total number of employees of the governmental unit for each month of the calendar year, regardless of whether a Form 1095-C is transmitted with that Form 1094-C). However, the governmental unit may designate to the DGE the requirement to file a Form 1094-C authoritative transmittal. For example, assume County X had 1,000 employees all of whom enrolled in employer-provided coverage, County X provided that coverage to 850 of its 1,000 employees through State Y self-insured plan, and County X delegated its reporting of offer of coverage information for those 850 employees to State Y (whether or not it also delegates its reporting of enrollment in coverage information to State Y). In that case, County X may also delegate the responsibility to file an authoritative transmittal Form 1094-C, so that the Form 1094-C filed by State Y indicating County X as the employer and State Y as the DGE would also indicate that it is the authoritative transmittal and report that County X had 1,000 employees as well as the number of those employees who were full-time employees. In that case, the Form 1094-C filed by County X covering the remaining 150 employees would not indicate that it was an authoritative transmittal. 28. May an employer hire a third party administrator or other third party service provider to file the return with the IRS and furnish the statements to employees required under section 6056? ALE members are responsible for reporting under section 6056. Generally, each ALE member must file a separate Form 1094-C providing that ALE member’s EIN. If more than one third party is facilitating reporting for an ALE member, there must be only one Form 1094-C authoritative transmittal reporting aggregate employer-level data for the ALE member. Additionally, there must be only one section Form 1095-C for each full-time employee with respect to employment with that ALE member. For additional details, see the instructions for Forms 1094-C and 1095-C and the 1094-C and 1095-C Questions and Answers. 29. For the methods of reporting, including reporting facilitated by a third party, may an ALE member file more than one Form 1094-C? Yes. An ALE member may file more than one Form 1094-C, provided that , one of those transmittals must be an authoritative transmittal reporting aggregate employer-level data for the ALE member. See the instructions for Forms 1094-C and 1095-C for further details on the authoritative transmittal. For example, Corporation XYZ has two separate operating divisions, Division A and Division B. XYZ may file separate Forms 1094-C for Division A and Division B, but must designate one of them as the authoritative transmittal reporting combined employer-level data including both divisions. 30. May an ALE member satisfy its reporting requirements for an employee by filing and furnishing more than one Form 1095-C that together provide the necessary information? No. There must be only one Form 1095-C for each full-time employee with respect to that full-time employee’s employment with the ALE member, so that all information for a particular full-time employee of the ALE member is reflected on a single Form 1095-C.
For instance, in the example in question 29 above, assume an employee worked for both Division A and Division B of Corporation XYZ during the year. Because both divisions are part of the same ALE member (Corporation XYZ), the employee would receive only one Form 1095-C from Corporation XYZ reflecting service in both Division A and Division B. By contrast, assume that the two divisions were separate employers, Subsidiary A and Subsidiary B. Each subsidiary is an ALE member that is required to file. An employee that worked for both Subsidiary A and Subsidiary B during the year would thus receive a Form 1095-C from Subsidiary A and a separate Form 1095-C from Subsidiary B. Note that a full-time employee of an ALE member may in some circumstances receive a Form 1095-C and a separate form 1095-B reporting coverage information under a self-insured plan sponsored by a related employer (for instance, a DGE that has been delegated reporting authority under section 6055 as discussed in question 26). However, no employee should receive more than one Form 1095-C from the same ALE member. 31. For information returns filed and furnished in 2017 for coverage offered (or not offered) in 2016 and later years, what penalties may apply if an ALE member fails to comply with the section 6056 information reporting requirements? Mid-West Truckers Association’s Trucker of the Month is Hetzels Overland Transport, Inc. of Effingham, Illinois. Owned and operated by Stacey and Darrell Durbin, Hetzels Overland Transport started out in 1993 as Poverty Trucking by Keith Hetzel. Poverty Trucking was providing spotter and shuttle services in Effingham for local business and manufacturing. As customers demanded longer distance services, Keith started Hetzels Overland Transport. Business grew and the company added more trucks to handle the increasing demand for over the road work. When Keith passed away, his brother Scott stepped in and ran the company operations. He hired Stacey Durbin in 2007 as a secretary to handle invoicing. Stacey had been involved in trucking for years and her husband drove a truck for another local company. Scott’s heart was in farming, not trucking, so in 2009 Stacey and Darrell purchased Hetzels Overland Transport and Poverty Trucking. Poverty Trucking is still doing spotter services and shuttle service in Effingham just as it has since 1993. Hetzels Overland Transport has had 18-20 trucks since 2009 and still does today. One of the first things Stacey and Darrell took care of was upgrading all the trucks and trailers to 2010 or newer models. All of the tractors are Internationals. Just the fuel savings alone on the new tractors paid for the cost of upgrading all the equipment. “We have almost all the same drivers when we bought the company, with very little turnover,” says Stacey. “We like to know our drivers and their families.” They also have a number of owner-operators leased on and pulling freight for Hetzels Overland Transport. With the many trucks and two companies, they have two full-time mechanics working on everything from DOT inspections to complete overhauls. Stacey and Darrell are happy with the size of their company and are not actively seeking large growth opportunities. They primarily haul Midwest regional van freight in a 500-700 mile radius of Effingham. With the recent changes to IRP they may look at doing a few east-coast and longer hauls in the future. Stacey manages the day-to-day operations and Darrell is the safety manager for both companies. They live in Dietrich, IL with their 17 year old daughter Alyssa and have twin girls Amber and Ashley, 21, who are attending Southern Illinois University at Carbondale. Stacey uses Mid-West Truckers Association to get answers to her trucking questions and takes advantage of the many services provided by MTA. “When I have a question, I never hesitate to call the MTA office and quickly get the answers I need,” she says. The Board of Directors of Mid-West Truckers Association expresses their true appreciation to Hetzels Overland Transport Inc, and Poverty Trucking for their 22 years of membership and salute Stacey and Darrell Durbin as our May Trucker of the Month. To learn more about Mid-West Truckers Association, click here. The federal Department of Labor (DOL) has submitted proposed changes to the Fair Labor Standards Act (FLSA) overtime regulations to the office of Management and Budget (OMB) for review. These regulations will increase the number of employees nationwide who qualify for overtime. Employers get ready, because these overtime changes will likely have a substantial effect on your workforce. Many employees who qualify for an exemption from overtime right now, will be entitled to overtime once the regulatory changes are finalized. On March 13, 2014, President Obama issued a Presidential memorandum directing the Secretary of Labor to begin the process of addressing overtime pay protections to increase the number of workers who would qualify for overtime. In May 2014, the DOL announced in its Semi-Annual Regulatory Agenda, under the section “Defining and Delimiting the Exemptions for Executive, Administrative, Professional, Outside Sales, and Computer Employees,” that the DOL was directing the Secretary to “modernize and streamline the existing overtime regulations for executive, administrative, and professional employees.” Proposed rules were originally due out in November 2014 according to the Agenda, but they were delayed. Thomas Perez, Labor Secretary, has just announced that the proposed regulations have been submitted to the OMB for review. The review process can take anywhere from 30 days to 60 days, or in some cases even longer. The DOL changes to the overtime regulations will increase the number of employees nationwide who qualify for overtime in several ways. First, it is very likely that the DOL will increase the salary threshold required for exemption, perhaps even double it. The current salary threshold for white collar employees is $455 per week. If the threshold increases, more employees will be entitled to overtime. Second, the DOL may make the duties tests for exemption more difficult to pass. The overtime regulations require that employees perform certain duties in order to be classified as exempt. An exempt administrative, executive, professional, computer, or outside sales employee must have his or her primary duty work that meets the first requirement of the standard duties test for the particular exemption. A determination of whether an employee passes the primary duty test is based on all the facts in a particular case. The amount of time spent in the performance of the required duties is one key factor. If a hard and fast minimum 50 percent time requirement is imposed on exempt primary duties, then these factors will no longer play into the analysis. Most employers will be affected by the changes to the FLSA regulations. In addition, most business establishments will incur costs from the changes. What types of costs are we talking about? Some costs will be one-time implementation costs and other costs will be ongoing for an indefinite period of time. To help ensure that your company will not be subject to an FLSA claim or a DOL audit, conduct an internal audit once the proposed regulations are released. Review job descriptions to determine whether they are still accurate, reflect the jobs being performed, and reflect the skills necessary to perform the job. Do you have the required posters hung in the appropriate places in the workplace? That is an easy violation for DOL investigators to spot right when they walk through the doors of your company. Make sure you have properly calculated overtime for nonexempt employees. And pay past overtime due to employees you have misclassified. Paying them now will be far less expensive than paying them in a DOL settlement or class action lawsuit. REFERENCE: HR.BLR Susan E. Prince, J.D. Thank you for celebrating with us Distracted Driving Awareness Month. As April closes down, you can still put an end to distracted driving and help save lives throughout the year. Avoid using hands-free devices while driving. Don’t use your dashboard Infotainment system for tasks unrelated to driving. Change your voicemail message to tell people that you may be driving and will call them back when you can safely do so. Share with others this educational Infographic and video. Register for our FREE April 21 webinar "Hands-free or Handheld: Risks your Workplace Can’t Afford." For more FREE resources including posters, fact sheets, and the NSC Cell Phone Policy Kit, visit us at nsc.org/cellfree. Thanks again for helping to promote Distracted Driving Awareness Month and spreading important safety messages. Guidelines for the selection and maintenance of ladders. Traffic crashes are the leading cause of workplace death. With one in four crashes estimated to involve cell phone use, we need to be concerned. Join NSC in educating your workers on the risks of driver cell phone use. Calls kill - it doesn't matter if a driver is talking on a handheld or hands-free device. More than 30 studies show hands-free doesn't make a driver any safer - the brain remains distracted by the conversation. April 9, "Our Brains on Technology: A Risky Combo for Drivers"
April 21 "Hands-free or Handheld: Risks your Workplace Can't Afford." Download these resources including, posters, fact sheets and a PowerPoint presentation to engage your employees during Distracted Driving Awareness month. Encourage your employees to take the Focused Driver Challenge and pledge to drive cell free. What to do when investigating an accident.